Integrating with the Anaplan Budgeting and Financial Planning Model and SFDC data, this Service Revenue Forecasting model collects financial forecasts and capacity requirements from the delivery and sales team. 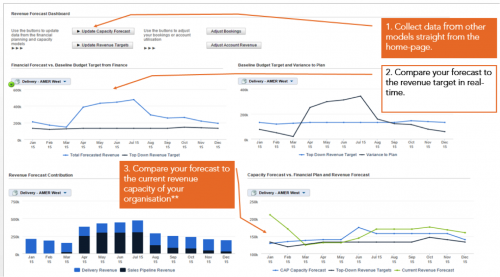 These inputs produce a live revenue forecast which is reported against the top down revenue plan, giving your organization a live view of forecast vs target. 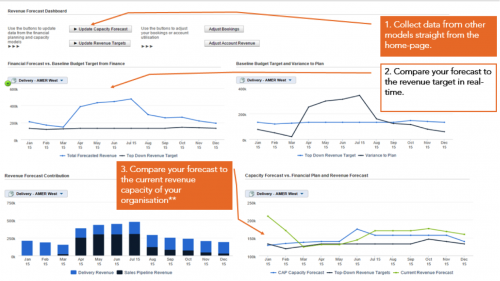 The forecast may then be output back to the Budgeting and Financial Planning Model and also the Capacity information is available for use in the OpenSymmetry Capacity Planning model, which enables the business to plan the organization resources against the revenue expectations set by the delivery and sales teams. Simple integration with the Anaplan Budgeting and Financial Planning app to collect top-down revenue targets. 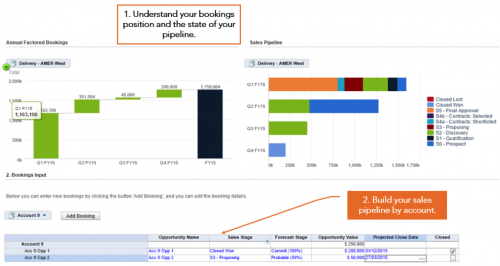 Integrate SFDC pipeline data to forecast based on services backlog, pipeline, and whitespace revenue (or “go-get”). 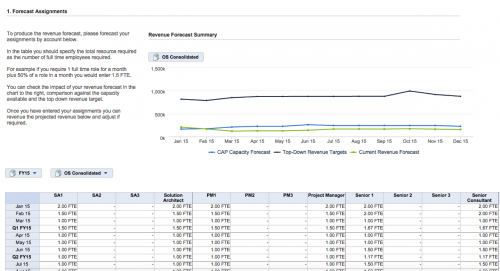 Further outbounds available to expand the app to include capacity planning functionality. Financial forecasting within the professional services organization requires timely input from multiple stakeholders, this app provides a platform to enable the organization to plan in real time using current financial data. All inputs are available to the full team in real time. Provides an account level of view of resource requirements and forecast based on the inputs from both delivery and sales, gives finance a full view of the forecast and provides credibility and evidence to support the financial forecast. If you include both the financial forecasting and capacity planning app, the app will provide a view of the projected revenue based on full capacity which can be used to further inform the financial forecasting. OpenSymmetry is a trusted leader and global advisor that delivers Sales, HR and Finance solutions that drive accelerated business performance. With a leading success rate across more than 20 industries, you can count on OpenSymmetry to deliver the comprehensive solutions you need for a proven path to rapid results -- from Strategy-to-Success.